A "sprint" triathlon is a 750-meter (0.47-mile) swim, a 20-km bike, and 5-km run. The Psychology Behind Fitness Motivation explores the psychology of why we don't like to exercise....and then offers ways to enhance your motivation. Recommended for: Anyone looking for motivation to stick to their exercise program. • Kim Chronister, PhD is a licensed clinical psychologist, and, a certified personal trainer. She is in private practice in West Los Angeles, CA. • Introduction: In the Intro, the author mentions that "autonomy" plays a huge role in whether a person sticks to an exercise program. The author states that people feel empowered when they learn what they need to do and what they can do. However, she says that "committing to be happy" (p. 13) is the #1 factor for success. • Chapter 1: In this chapter, the author discusses clinical psychology techniques such as "cognitive behavioral therapy" and "motivational interviewing." This content seems out of place for a consumer book. The summary of the 5 stages of change might be somewhat useful to readers. The author states that her program is "evidence based" however, no citations to published research are mentioned or listed in the References at the end of the book. • Chapter 2: This chapter briefly discusses the beneficial effects of exercise on stress and mood. The author states that exercise is regarded as a primary therapeutic strategy for this in the UK, but less so in the US (p. 27). Since this is a clinical/medical discussion, it would have been helpful to cite a white paper, or other scientific publication here. This chapter is somewhat useful, however, the discussion of brain neurotransmitters and specific types of antidepressant drugs is likely not very interesting to the average reader. On p. 36, she points out that one of the main reasons why people fail to exercise regularly is because they pursue a program that is not appropriate for their fitness level. This seems to be good advice for the average person. The black-and-white photos in chapters 1 and 2 are strange: one is completely out of focus, one looks like it was shot from a car (you can see the rear-view mirror on the door), and most of them seem to have no relevancy to the text. • Chapter 3: In this chapter, the author discusses how thinking affects behavior. She recommends people write down their wishes, and then do things that help them commit to those goals. • Chapter 4: In this chapter (p. 48), the author provides a list of "irrational beliefs" that can sabotage achieving new goals. In the 2nd half of this chapter, the author provides a questionnaire that the reader can use to uncover and begin to address any irrational beliefs. This chapter is well done. • Chapter 5: In this chapter, the author discusses the concept of motivational interviewing. Some of this seems too clinical for the average reader. However, the 2nd half of the chapter has another useful questionnaire. • Chapter 6: This chapter is a weak attempt to provide readers with some specific work-out plans. The author tries to address spinning, circuit training, swimming, yoga, tai chi, and Pilates....difficult to cover all this in only 11 pages. • Chapter 7: This chapter gets back to psychological motivators for exercising regularly. The text in this chapter is good, but, the photos are downright awful: some are out of focus, some are too dark, and some have distorted proportions. • Chapter 8: This chapter focuses on "self-talk" and again discusses cognitive behavioral therapy. It seems as though this discussion should have been folded into Chapter 1 where this concept was first introduced. 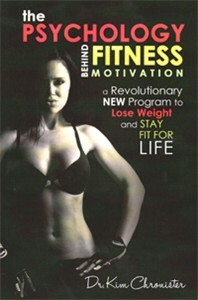 • Chapter 9: This chapter offers the reader some simple but useful tips for sticking with their exercise routine. • What I Liked: The book is succinct, and does have some worthwhile points. The questionnaire sections would seem to help people understand their own personal roadblocks for success. • What Could Be Better: This book needed a copy editor and a developmental editor! While there are some useful concepts here, the presentation is not very well done. The black-and-white photos throughout the book can only be described as "strange" and "poorly done." Some are out of focus, and most seem to have little to no relevancy to the juxtaposed text. I have never seen a book with photos this poorly done. Even though this book has some serious deficiencies, it does contain some wisdom. The questionnaires will force you to have a serious conversation with yourself. 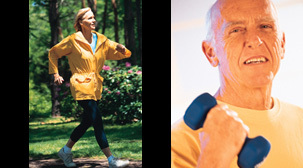 In doing so, you may find the motivation you need to stick to your exercise program.